Mass is held every Sunday morning at 10am in St Michael’s Church, any changes to this will be posted in the window of the Post Office in Rerrin. 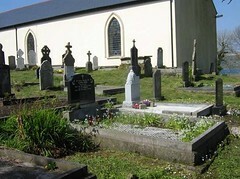 Bere Island Cemetery is situated beside Saint Michael’s church, in the area of Ballinakilla. A committee was established in 1994 to care for the cemetery. It was cleaned by the committee and is being maintained by community employment participants regularly. A survey was carried out in 2009 whereby all graves were identified and numbered. Any persons wishing to find the gravestone of a relative can access the graveyard database at The Heritage Centre. There are a number of British Military personnel graves dating from the 1900’s which are also maintained and there are graves of Spanish seamen who lost their lives at sea in Berehaven harbour. Mass is celebrated in the grounds of the cemetery every August in conjunction with the Bere Island Festival. This mass is always very well attended by islanders and festival visitors.